nine + 1 = Required Please enter the correct value. I'm fresh off the plane from the South by Southwest Interactive festival in Austin, Texas, where hundreds of the market's most innovative tech products are displayed for the more than 65,000 exhibition hall visitors. SXSW Interactive is one of the largest festivals of its kind in the world. In addition to the exhibit hall displays, more than 32,700 attend 1,100 conference sessions on technology, digital media, Web audience development, and the future of publishing. 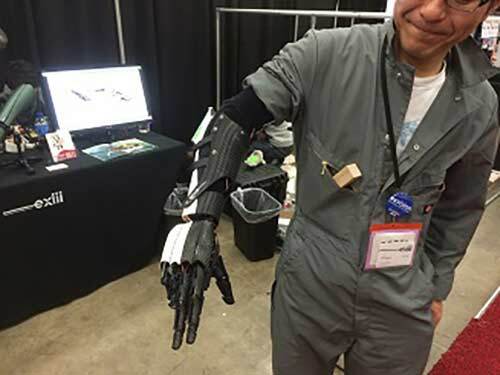 Exiii demonstrators show off their robotic arm technology at SXSW Interactive. One of the most exciting parts of SXSW is how the brightest developers and inventors come together to demonstrate new products for consumers and potential investors. Integrating Robotics with Prosthesis: One of the most impressive products demonstrated was a fully functioning robotic arm. And the best part about the Japanese company Exiii's demonstration was that their first customer was there showing it off. Sensors attached to the wearer detect the signal the muscles are making. From there, a signal is sent to the person's smartphone wirelessly. The smartphone then controls the robotic limb. The hand is as functional as a human hand. You can move your fingers and pick up items of all shapes and sizes. Mr. Morikawa demonstrated different hand signals with his "Handiii" for a group of us watching. Morikawa lost much of his arm in a factory accident two years ago. According to the company it only took him about 10 minutes to get adjusted to the device when first using it. 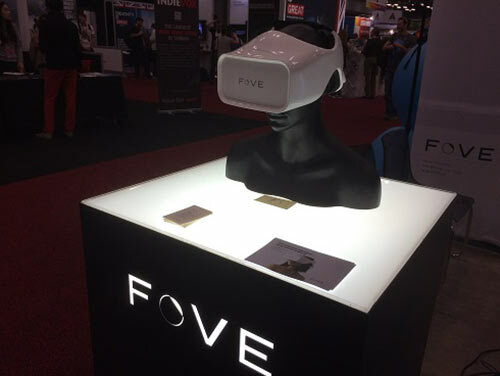 Wearable Headsets: Headsets were a popular trend this year, but the coolest I saw was from FOVE Inc. Theirs follows the wearer's eye movements – and it's the first of its kind in the world. San-Francisco-based FOVE is a Microsoft Ventures Accelerator company, and is exploring how they can integrate their technology with the Xbox. The FOVE headset immerses users in a realistic 3D world. By moving your eyes to different places on the screen, users can play the piano, type a message, or move their characters in a game. "We can generally make VR how it should be, positioning things like depth of field," Chief Technology Officer Lochlainn Wilson told the International Business Times. "So what you're looking at is in crisp focus, but what you're not looking at gets nicely blurred." Wearable Smart Rings: One of the biggest crowd-pleasing pieces of wearable tech innovation was this Ring Zero "smart" ring from Logbar.